Wow - time has been flying by! It seems like I got my last fix yesterday, and here we are again! 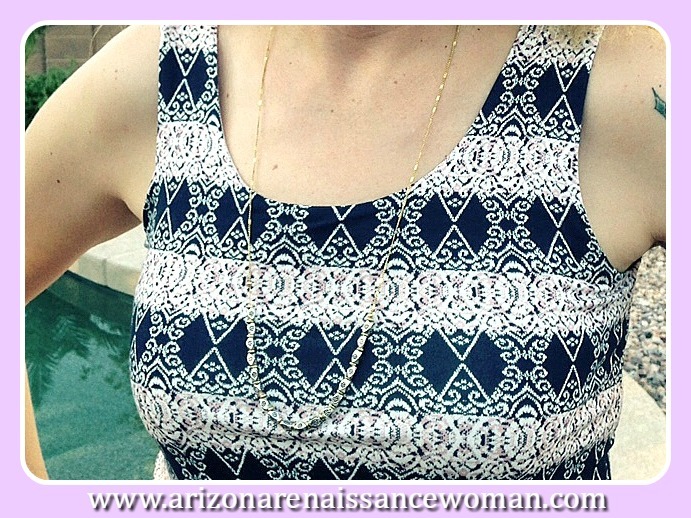 Another Stitch Fix review! I have to tell you, it's a miracle that I got this one done today. It's been a really busy week; it was a really busy day, et cetera, et cetera . . . I almost have to laugh about it now, because I was really crabby when I took most of these pictures. Ask my husband about that. Ha ha. When I first saw these, my first thought was, "Oh, man . . . black pants?" I have soooo many black items of clothing. Pants. Skirts. Tops. Dresses. I even have a note in my style profile stating that I'd rather avoid plain black items for now. I do wear all black to most of our concerts at school, so it's a necessity. I don't find black particularly exciting, though. I decided to get with the program and I styled these pants with some studded ballet flats and a top from White House Black Market. I was pleasantly surprised. The fit was great. They're so skinny that they're like leggings, but they are substantial enough that I think I will feel comfortable wearing them to work. I have a love/hate relationship with stretchy pants. I like how forgiving they can be, but I hate when they start to sag after an hour or two and I spend the rest of the day pulling them up. These feel like they will stay in place. I'm hopeful. I'm still learning to wear ankle-length pants. When I put these on, they felt short, but I think they are supposed to be that way. I think ballet flats will be the perfect match for these. I just realized that they are skinny enough for riding boots, also! I think I can create several cute outfits with these. I have two great pairs of black slacks that I wear to work ALL the time, but I don't have any that fit like this, so they will be a good addition to my wardrobe. Seriously, though . . . I don't need any more black pants in the near future. Under any circumstances. Ha ha. I wasn't sure about this dress at first. The print is cute. The top fits great. I love the shape of the skirt. I didn't love the elastic waist, though. I didn't think it was very flattering. My husband liked it a lot, though. I also sent a picture to my youngest sister (who is way more stylish than me) and she seconded him. I looked at all my pictures, and I did notice that the dress was much more flattering when I was standing up straight. Maybe there's something to that . . .
My problem with dresses is that I just don't wear them very much. I rarely wear dresses to school and only occasionally go out to places where a dress seems like the most appropriate choice. I do like cute dresses, though! WTH? I'm keeping it and giving it a try! The price is right! So. There's not much to say about this bracelet. I LOVE it. It's pretty badass. If I had two of them, I would totally feel like Wonder Woman. Or a Greek goddess. Or something. That would probably be over the top, though. I think I'll stick with just one. I will definitely wear this. It's my favorite item in the whole box! I have been in a rut with jewelry for a long time. I LOVE silver jewelry, but I always seem to wear the same kinds of things. I'm trying to branch out a bit, so I asked Melanie for some mixed metal pieces. In addition to the bracelet, she picked this necklace. If you read my last review, you already know that I am challenged when it comes to bags. I did clean out my purse and I'm totally ready for some cute little bags that I don't end up cluttering with receipts, too many lipsticks, and other junk. This isn't exactly what I had in mind, but I'm going to give it a chance. When I first saw it, I thought it was a little too preppy-ish. Out of all the possible style motifs, "preppy" is the one I relate to the LEAST. I think. Maybe it's the bright gold accents? The tan strap? I don't know. I probably have no idea what I'm talking about. I don't think this will be an everyday bag for me. I do think I'll be able to use it now and then, though. What if I style it with this cute green polka dot dress? I don't wear the dress that often, but that could work, right? My sister told me that this bag is not preppy. She said it's neutral. I believe her. I have no natural fashion sense. I learn everything I know about fashion from the internet. Leopard is the new neutral. Does everybody know that? Sorry . . . I digress! Well, since I'm keeping the other four items, it's cheaper for me to keep the bag than it would be to send it back. I'm excited to see how I can make it work with other outfits! Well, I can't wait to see what I get next time! The weather is almost ready to turn! Maybe I can try some light layers in October . . . we'll see! Please comment? Did I make the right calls? Have you received any of these items? What did you think? Is anyone else out there bag-challenged? Did you find a style that works for you? Thanks again for reading! The bag is cute! The long strap is actually handy. Think of it more for cross body than over the shoulder. I adore smaller cross body bags for those times when you need something to carry your phone, ID, keys and lipstick but you also want to keep your hands free or you don't have a place to safely store your purse. I have a couple of them for when we play tourist downtown or go to sporting events/concerts etc. Cute fix! Your stylists does a good job! I got my October box. Low and behold, a pair of black houndstooth Emers. They are COMPLETELY different than the coral/black ones. It's a totally different feeling material and they are a bajillon times nicer. I still like the coral ones, but holy wow, I see why people have been going bonkers over these pants.